Sri Lanka's previous engagement before landing in Dhaka was the Commonwealth Bank tri-series, the longest ODI tournament outside the World Cup and the Champions Trophy. With eight matches per team in the league phase, Sri Lanka had to wait almost a month to find out if they would make the final. In the Asia Cup, they could be eliminated three days after their first game - a loss to Pakistan tomorrow, and an India victory on Friday would end both Bangladesh's and Sri Lanka's chances. Mahela Jayawardene wasn't perturbed that Sri Lanka will most likely have to win tomorrow against Pakistan. "It is (a do-or-die match), but we are used to that. In Australia we had quite a few of those. It's still in our control so we don't have to depend on anybody else," he said. "I quite like that situation. We know how important the match is going to be tomorrow, so looking forward to that." Pakistan took on Sri Lanka last November and comfortably won the one-day series, as the spin of Shahid Afridi and Saeed Ajmal proved too good. "Ajmal has improved tremendously in the last year and it shows in his record. In Dubai when we played against him, we had good and bad times," Jayawardene said. "Hopefully we'll have to handle him better tomorrow because it's a one-off game for us. Umar Gul is also one of the top fast bowlers and Afridi can be a handful." Sri Lanka's own bowling would get a lot more teeth if their pace spearhead is deemed fit enough to play tomorrow. Lasith Malinga was rested from the first game as he was recovering from an injury which he carried in the finals of the CB series. He didn't seem to be in too much discomfort as he bowled and batted during Sri Lanka's practice session in the afternoon, and they will be tempted to pick him, considering their final league match is against relative lightweights Bangladesh. One of Malinga's biggest weapons is reverse swing, which he uses devastatingly to slow down teams at the death. Brett Lee has complained about how the use of two new balls was reducing the amount of reverse swing available, and as a result reducing the effectiveness of fast bowlers. 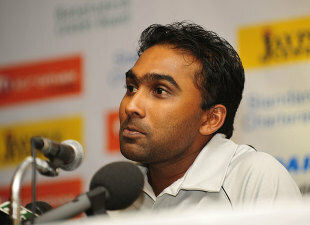 Jayawardene, though, said that was not the case in the subcontinent. "Probably in conditions in Australia and England to a certain extent, but even yesterday we saw after about 30 overs, our guys managed to start getting reverse back," he said. "Surfaces are much more dry here and the balls do get older. You still can reverse the ball. I thought that [Suranga] Lakmal, Kula [Nuwan Kulasekara] and even [Farveez] Maharoof, to a certain extent, did reverse the ball. "In other countries like England, Australia, New Zealand and South Africa, you don't need reverse swing. With the two new balls and the wicket helping you (fast bowlers), it's quite a handful (for the batsmen)."